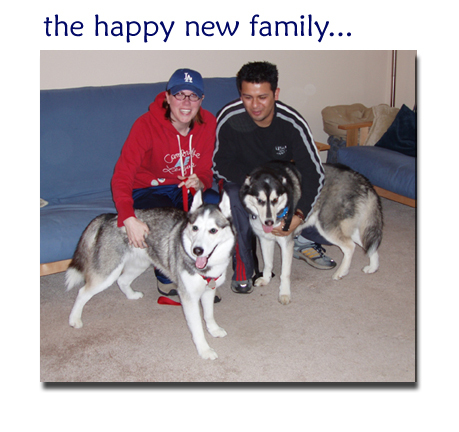 Togi found his new home on March 12, 2006 with Courtney, Jorge and husky Bianca. 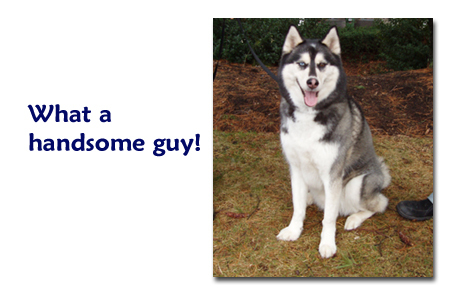 Togi is a handsome Siberian Husky who is about 6.5 years old. He has a gorgeous black and white coat with a full mask. His penetrating eyes -- one blue and one brown -- will make you melt. 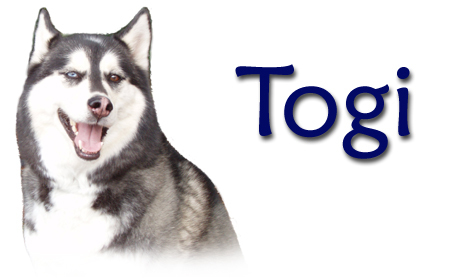 Togi is a former foster dog of Tails of the Tundra, adopted out the first time in 2000, but the family's move out of the country forced them to look for a new home for Togi. Courtney and Jorge were looking for a playmate for their 2 year old husky Bianca and it was Togi who won Bianca's heart. The two are great together and Bianca is quite smitten with her new man. We wish them many happy years together! very happy that Togi is part of our family!